Formulas to find Area of Rectangle, Square, Parallelogram, Triangle, Circle, etc. 1. Square: A square is a plane figure with four equal straight sides and four right angles. 2. Rectangle: A rectangle is a four-sided shape that is made up of two pairs of parallel lines and that has four right angles. 4. 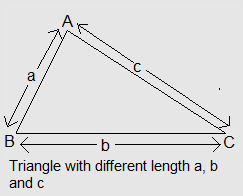 Triangle: A triangle is a a plane figure with three straight sides and three angles. 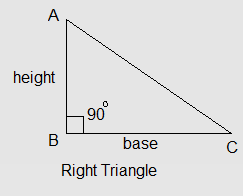 (i) Right triangle with base and height given. 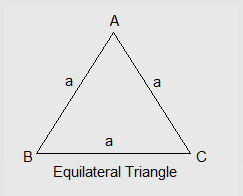 (ii) Triangle with three different sides a, b and c.
(iii) Equilateral triangle - A triangle with all three sides of equal length. 5. Parallelogram: A parallelogram is a 4-sided flat shape with straight sides where opposite sides are parallel. 6. Circle: A circle is a round plane figure whose boundary (the circumference) consists of points equidistant from a fixed point (the centre).